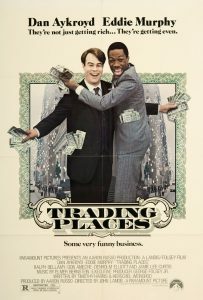 Take two complete strangers, make one of them rich the other poor… just watch the fun while they’re… TRADING PLACES. A classic 80’s bank comedy! A wager over whether it is a person’s environment or genetic inheritance that determines how well they will do in life has two men leading very different lifestyles changing places with some very 80’s consequences and results.